Young people constitute approximately 66% of the entire population. And India is heading to be the world’s largest youth population. But in spite India being the youngest nation, we hardly see young people in the leadership roles, as decision makers, as CEOs of the organizations, heads of the Churches etc. What is the reason behind this lack of space for young people. Young people lack the space they deserve because their space is being occupied by others. Young people are pushed to the margins denied space and opportunity. How we claim our space is the question before us, Commission on Youth has been organizing several leadership training programmes since its inception and has trained young people into leadership roles and encouraging them to join the ecumenical movement. We have started reaping the fruit of the toil and have seen few young people joining the Ecumenical Movement and giving leadership to few organizations, though this is an achievement in itself. This is not sufficient; there is need for claiming more space. It is in context, the UN theme for International Youth Day theme “Youth Civic Engagement” becomes relevant and contextual. The engagement and participation of youth is essential to achieve sustainable human development. The engagement of Youth is necessary to offer innovative ways of solving the crisis at various levels, youth leadership is important to ensure we give space for second line leadership. Young people are less represented, be it in the church committees, be it in the leadership roles of the church and society. But when it comes to Dalit youth, the space is further shrunk and further more worse for dalit women. Though there are dalits who have contributed to the church and society, their caste identity doesn’t allow their contributions to see the day, they remain in the dark. 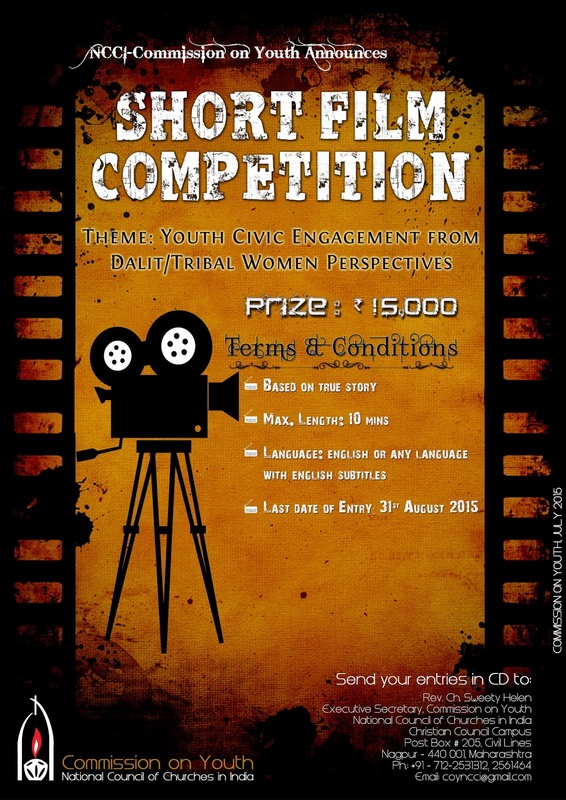 Therefore, this year, the Commission on Youth has decided to conduct a Short Film contest for its constituent members. The aim of this contest is to encourage young people to shoot short films on the contributions of dalit young women who have contributed to the church and society through civic engagement. · To be exposed to, and to appreciate and acknowledge the contributions of the Dalit young women to the Church and society. The Commission on Youth invites individuals and churches to institute prizes in their respective name. The prize money will be given by the NCCI Commission on Youth on every International Youth Day to the best entry/participation in the programme/competition organized for the year.